The Xenics Bobcat series of InGaAs cameras provides customers with exceptional performance when working in the SWIR part of the spectrum. The detectors can see through glass which makes the use of standard C-mount lenses a possibility, although high specification SWIR tuned lenses are also available to enhance image quality. Triggering is a common feature across the range, as is the ability to adjust integration time. 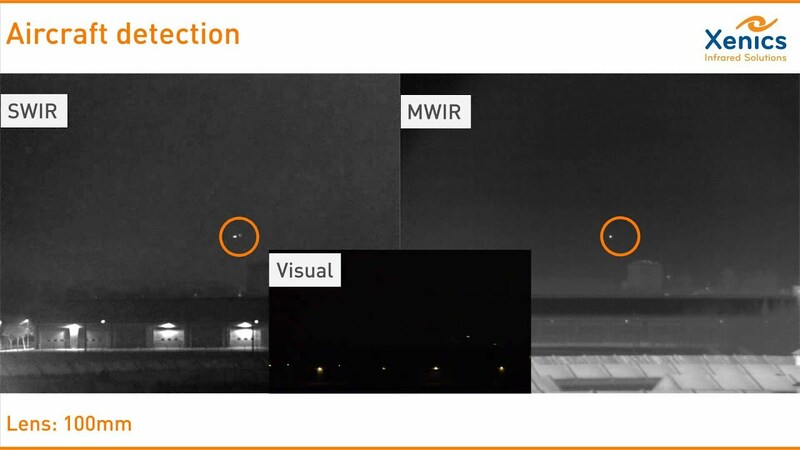 This video shows a comparison between the Visual, Shortwave infrared and Midwave infrared wavelength for the detection of aircrafts. The distance to the aircraft in this footage is around 5-6 km. As you can see there is no detection in the visual wavelength. In SWIR and MWIR the incoming airplane is clearly detected. This demonstrates the advantage of these technologies over regular visual equipment. The Xenics Bobcat 640 is the smallest, high performance SWIR camera in the world. The thermoelectric cooling ensures that the sensor has excellent low noise and low dark current characteristics. This perfectly supports imaging with long exposure times. The camera can be supplied with a 0.9 μm to 1.7 μm sensitivity range or an optional Visual NIR version from 0.4 μm to 1.7 μm for extended flexibility. The camera offers frequencies from 100 to 400 images per second (Bobcat-320) and transfers its data with either CameraLink or GigE Vision. Thanks to these standardized industrial imaging interfaces, a wide variety of software can be used for data processing. The Xenics Bobcat 320 uncooled camera is an affordable option for SWIR imaging. Output options range from CameraLink through GigE. A gated model exists which offers an integration time down to 80 ns making this an ideal camera for imaging of very hot or fast moving objects. XENICS BOBCAT VISNIR 640-20-100-CL 0,3 100 C-mount 640 512 1"
XENICS BOBCAT VISNIR 640-20-100-GE 0,3 100 C-mount 640 512 1"
XENICS BOBCAT-320-20-100-CL 0,08 100 C-mount 320 256 1"
XENICS BOBCAT-320-20-100-GE 0,08 100 C-mount 320 256 1"
XENICS BOBCAT-320-20-400-CL 0,08 400 C-mount 320 256 1"
XENICS BOBCAT-320-20-400-GE 0,08 400 C-mount 320 256 1"
XENICS BOBCAT-640-20-100-CL 0,3 100 C-mount 640 512 1"
XENICS BOBCAT-640-20-100-GE 0,3 100 C-mount 640 512 1"
Basée à Leuven en Belgique, la société Xenics conçoît, fabrique et commercialise dans le monde entier des produits de vision infrarouge à la pointe de la technologie.